The theme for Project Run and Play this week is to choose your favorite fashion icon and make a child’s outfit using them as inspiration. Immediately I knew what I wanted to make. While this person isn’t really a fashion icon, and isn’t exactly a real person either, it’s been fun to watch her fashion sense grow throughout the years. 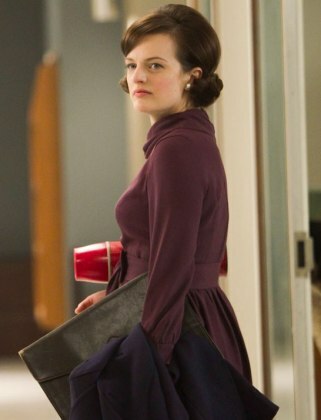 It’s Peggy from Mad Men, hehe. 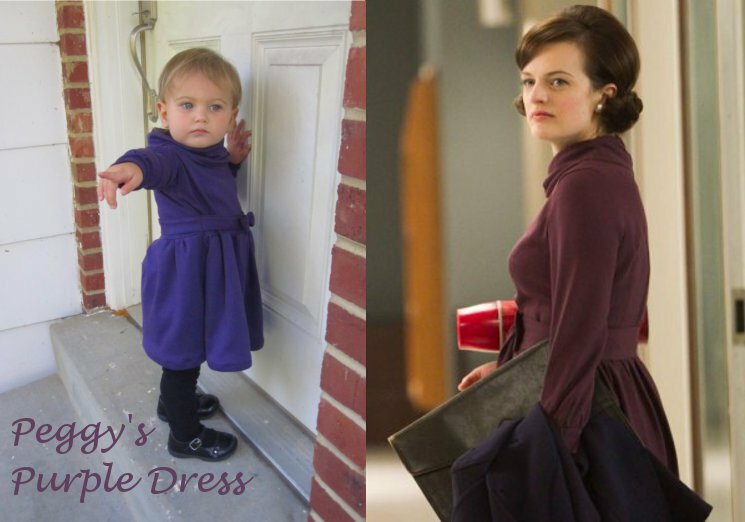 As we watched this past season I was constantly interrupting the show to tell my husband how much I liked her outfits. The dresses she chose gave her a more powerful look while still maintaining modesty in the workplace. As she’s stepped up in her career, so has her style and I’ve enjoyed watching the change. 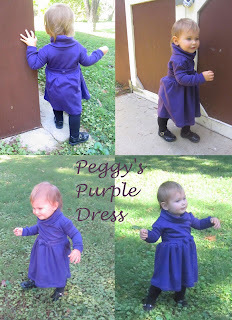 The specific dress that I chose to make was the purple dress she wore (spoiler alert! hehe) when she quits and moves on to another ad firm. At first glance it looks like a simple sweater dress, but it’s more than that. There’s a softness to it that I hadn’t seen from Peggy before. To start, I drafted a pattern for a turtle neck with a cowl neck so it would hang loosely. 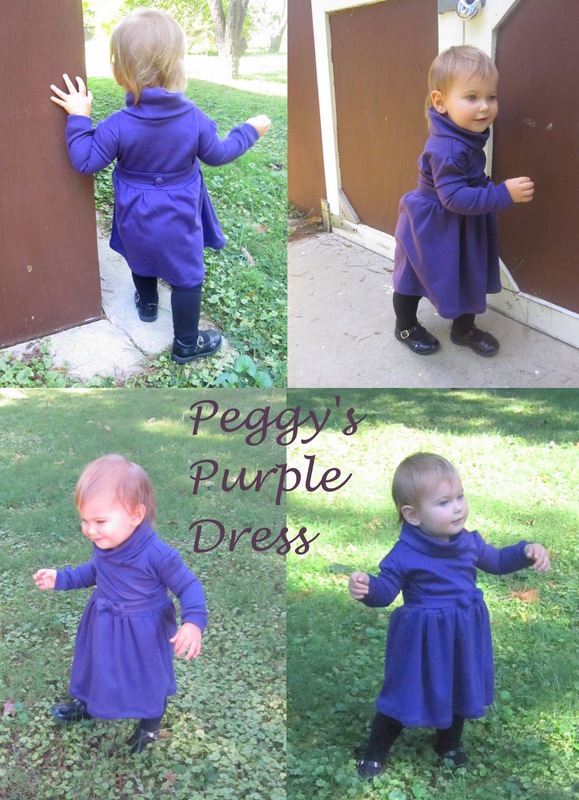 That was great, because Bean needs some fall clothes and now she has a black turtle neck to layer. I did the puff in the shoulder and wrist a little more dramatically so there would be a more childish feel. Even with the puffs I swear Bean looked like Dieter from SNL, hehe. Then I made a pink dress from the turtle neck I drafted by adding a simple gathered skirt to it. It turned out similar to how the purple would later turn out, but I wanted to fine tune things like the bow belt. Yet another fall outfit for Bean to wear, bonus! I added a little covered button (I am obsessed with making buttons!) to the back of the belt to bring some detail to the back. The tights are a little long, but I want them to last the winter so I don’t mind the little bunching in the legs for now. I sort of used the tutorial from Made By Rae but I didn’t follow along and sort of winged it. Bean likes her dress and the new shoes I got her. Just a few more separates and she’ll be all set for fall! I'm sure l-ster wants to be Dieter for Halloween. That's why she was trying to hide in the shed when you took those pictures. I can't believe how old she looks with those shoes!! 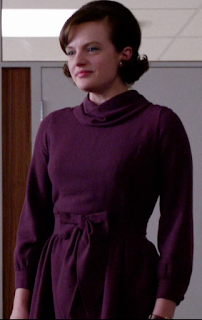 I do not like that dress on Peggy but it looks really cute on l-ster.